BACKGROUND AND PURPOSE: MR angiography is primarily and increasingly used to assess intracranial arterial stenoocclusion. However, MR angiography can cause overestimation of stenosis. Although CT angiography is accurate, it has limitations. Our purpose was to determine whether the accuracy of combined MR angiography and CT angiography is equal to that of digital subtraction angiography (DSA) in measuring stenosis and detecting major intracranial arterial occlusion. METHODS: CT angiography and intraarterial DSA were prospectively performed in 18 patients with suspected intracranial stenoocclusive disease, as revealed with MR angiography. Before DSA, two reviewers independently assessed MR intracranial angiograms. Subsequently, they assessed CT angiograms with MR angiograms. Results were compared with DSA results. The degree of stenoocclusion was categorized; stenosis of 50% or more indicated stenoocclusive disease. After the blinded study, two radiologists retrospectively reviewed the angiographic findings. RESULTS: Stenoocclusive disease was identified in 18 of 198 intracranial arteries at DSA. MR angiography had a sensitivity of 92%, a specificity of 91%, and an accuracy of 91% for the identification of stenosis of 50% or more; the addition of CT angiography yielded values of 100%, 99%, and 99%, respectively. Stenotic grades with combined CT angiography and MR angiography agreed with those of DSA in 98% of cases. In the retrospective study, CT angiography did not always correctly delineate arterial lumina with circumferential calcification and cavernous portions of the internal carotid artery. CONCLUSION: In this investigation, the evaluation of suspected stenoocclusive diseases in major intracranial arteries, the accuracy of combined MR angiography and CT angiography is equal to that of DSA in most cases. Atherosclerotic narrowing of the major intracranial arteries (carotid siphon; anterior, middle, or posterior cerebral arteries; vertebral artery; basilar artery) is associated with a risk of stroke (1). Results of the Warfarin-Aspirin Symptomatic Intracranial Disease Study showed that symptomatic patients with 50–99% stenosis of an intracranial artery benefited from anticoagulation therapy (2). Although conventional angiography or arterial digital subtraction angiography (DSA) is a reference standard for evaluating intracranial stenoocclusive disease, cerebral angiographic complications still remain. Among noninvasive imaging techniques, MR angiography allows accurate discovery of intracranial stenoocclusive diseases, and it is widely used as a screening method (3–7). CT angiography also offers a noninvasive and accurate means of evaluating intracranial vascular diseases (8–12). Because MR angiography and CT angiography have spatial resolution inferior to that of DSA, and because they do not provide precise information regarding intracranial hemodynamics and the entire cerebral vasculature, these noninvasive imaging techniques may not be able to replace DSA. However, with regard to measuring stenosis and detecting occlusion of the major intracranial arteries, combined MR angiography and CT angiography may have an accuracy equal to that of DSA. To our knowledge, no prospective studies have been performed to systematically investigate whether combined MR angiography and CT angiography can accurately reveal the degree of stenosis and occlusion in the major intracranial arteries. The purpose of this study was to determine whether the accuracy of combined MR angiography and CT angiography is equal to that of DSA in measuring stenosis and detecting occlusion of the major intracranial arteries in patients with suspected stenoocclusive diseases. From June 1998 to June 1999, 498 patients were referred for MR imaging and MR angiography because of suspected neurovascular symptoms. 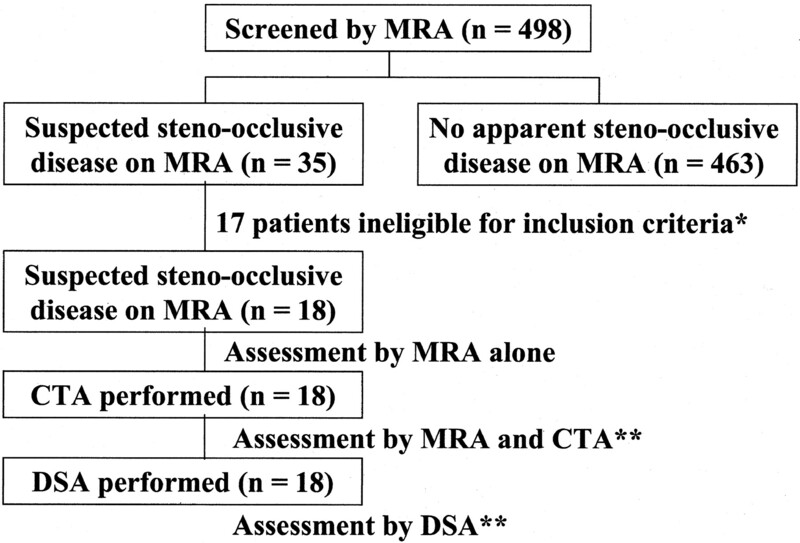 During that period, patients were selected for the prospective study if stenoocclusive diseases of the major intracranial arteries were suspected, as revealed at MR angiography (Fig 1). An artery with stenosis of 50% or more was considered to be diseased. Other criteria for inclusion in this study were the availability of MR angiograms with good quality for diagnostic purposes and the acquisition of informed consent from the patient. Patients were excluded if they had a history of brain surgery or risk factors such as heart failure. After two radiologists initially independently assessed the MR angiograms, CT angiography was performed, and the radiologists then assessed both the MR angiograms and the CT angiograms. Finally, intraarterial DSA was performed. These three imaging modalities were performed within 3 weeks of each other. Symptoms and signs included transient ischemic attack (n = 6), dizziness or vertigo (n = 4), hemiparesis (n = 3), gait disturbance (n = 2), transient loss of consciousness (n = 2), and amaurosis fugax (n = 1). The assessed intracranial vessels included bilateral segments of the internal carotid artery (C3 [carotid siphon] and C2 and C1 [supraclinoid] segments), middle cerebral artery (M1 [horizontal] segment), anterior cerebral artery (A1 and A2 segments), posterior cerebral artery (P1 and P2 segments), vertebral artery (intracranial segment), and basilar artery. Thus, 11 arterial sites per person were evaluated. Flow diagram shows the enrollment and assessment of patients. * indicates the criteria for inclusion into the study, which were the availability of MR angiograms of good quality for diagnostic purposes, the acquisition of informed consent from the patients, and the absence of a history of brain surgery or risk factors such as heart failure. ** indicates cases in which one radiologist judged the quality of the CT angiograms and digital subtraction angiograms as excellent or good for diagnostic purposes. The results of the assessments of MR angiograms and CT angiograms were compared with those of DSA. MR angiography was performed with a 1.0-T superconductive unit (Magnetom Impact; Siemens, Erlangen, Germany) by using a circularly polarized head coil. The 3D time-of-flight MR images were obtained with 35/9.6 (TR/TE), a flip angle of 25°, a matrix of 144 × 256, and a field of view of 20 cm. The acquisition data were increased to a 288 × 512 matrix by using an interpolation technique. The whole volume was divided into three slabs, with 28% overlap. Each slab consisted of 32 partitions, resulting in a total of 88 sections of 0.94 mm. The overall vessel coverage with this technique was 82.4 mm, and a slab was placed to include the structures from the foramen magnum to the A2 branch of the anterior cerebral artery. Cephalad saturation pulses were applied to eliminate venous blood signals. Ten maximum intensity projection (MIP) images and selective MIP images for each carotid artery and vertebrobasilar artery were generated and printed on hard-copy film after they were reviewed at the MR console so that optimal windows could be selected to better assess the occlusive lesions. When one radiologist suspected stenosis in a vessel on the basis of MIP images, axial source images and the coronal or sagittal images for the suspected lesions also were reconstructed with a multiplanar reconstruction (MPR) technique and printed on hard-copy film. CT angiography was performed with a helical CT scanner (W3000 AD; Hitachi, Tokyo, Japan). In each case, the imaging site was determined according to the location of the suspected stenoocclusive disease, as revealed by the MR angiograms. When the location of the lesion was supratentorial, the volume imaging was started at the level of the sellar floor and continued cranially. When the location of the lesion was infratentorial, the volume imaging was started near the level of the foramen magnum and continued cranially to the circle of Willis. Volume data were acquired in 30–40 seconds by using a section thickness of 1 mm and a table speed of 1 mm/s (175 mAs, 120 kV); the imaging volume was 30–40 mm with a 512 × 512 matrix. Nonionic contrast material (100 mL of iopamidol, 300 mg of I per mL) was injected into the antecubital vein at a flow rate of 2.5 mL/s by using a power injector (Auto Enhance A-50; Nemoto Kyorindo, Tokyo, Japan). To optimize the imaging delay time, an automatic triggering system was used to detect a contrast material bolus in the carotid artery near the skull base. This triggering technique consisted of region-of-interest measurement in the carotid artery during low-dose image acquisitions every 2.5 seconds, beginning 10 seconds after contrast medium injection. When carotid enhancement reached 80 HU, the spiral image was initiated after a 5-second delay. Images were reconstructed every 0.5 mm. Image reconstruction was performed with a voxel transmission method (13), a volume-rendering technique, to create 3D CT angiograms. Eight voxel transmission images were generated from the data sets. Selective voxel transmission images also were generated for suspected stenosis. The axial source images and coronal or sagittal images of suspected stenoses, as revealed by MR angiography, were reconstructed with an MPR technique. The MPR images also were generated for infraclinoid portions of the internal carotid artery. All images were printed on hard-copy film for evaluation. After the evaluation of MR angiograms and CT angiograms, intraarterial conventional DSA was performed by using a 1024 × 1024 matrix with a DSA unit (DFA-100, Hitachi). All catheterizations were performed via a transfemoral approach by using the Seldinger technique. The angiographic procedure was routinely accomplished with a standard diagnostic catheter. Selective angiograms of the internal carotid and vertebral arteries were obtained bilaterally in the anteroposterior and lateral projections. For each projection, 6–7 mL of nonionic contrast material (Iopamiron 300 [300 mg of I per mL]; Schering, Osaka, Japan) was injected at a flow rate of 3–5 mL/s by using a power injector (Auto Enhance A-50; Nemoto Kyorindo). Two experienced reviewers established, by consensus, the presence or absence of stenoocclusive disease and its severity (grade) on the basis of findings on the digital subtraction angiograms. Two radiologists independently assessed the MR angiograms. Subsequently, the CT angiograms were reviewed with the MR angiograms. When the MR angiographic and CT angiographic findings were being analyzed, clinical data were not available to the reviewers. The diameters on the MR angiograms and CT angiograms were magnified with a ×5 magnifying loupe and measured by using a commercially available vernier caliper with 0.1-mm divisions. To maintain uniformity in choosing the location of the vessel wall, the outermost margin of the vessel was selected on the MIP, voxel transmission, and MPR images. The percentage of stenosis was measured by comparing the diameter of the maximally stenotic region with the diameter of a nearby normal segment of the vessel. If stenosis of 50% or more was suspected on MIP or voxel transmission images, the MPR images were used to measure the stenosis. When measurements were made on the MPR images, measurements of the stenosis on one section and the nearby normal vessels on another often were necessary. The MPR images were always analyzed in conjunction with the corresponding MIP or voxel transmission images because of the potential for misinterpretation inherent in the evaluation of MPR images alone. If stenosis of less than 50% was suspected on MIP or voxel transmission images, measurements were made on the MIP or voxel transmission images, and the projection that showed the greatest stenosis was chosen. Measurement was not performed when the vessel appeared to be normal or occluded on MIP, voxel transmission, and MPR images. If the stenosis was present at more than one site in one segment, the greatest stenosis was selected as a representative stenosis in the segment. Both reviewers individually categorized the degree of stenoocclusive disease, as determined quantitatively, into five classes of stenosis: normal, 0–29%; mild, 30–49%; moderate, 50–79%; severe, 80–99%; and occlusion, 100%. Each segment was considered to be a separate vessel and was scored. Both observers reviewed findings that led to a disagreement to reach a consensus. When a diffusely small diameter of the A1 segment of the anterior cerebral artery or vertebral artery was identified, it was considered to be hypoplastic and normal. When the fetal type of the posterior communicating artery was identified, the posterior cerebral artery was assessed for the posterior communicating artery and the P2 segment. Finally, the two radiologists individually measured and categorized the stenoses on the digital subtraction angiograms. One radiologist (who did not participate in the blinded study) classified the quality of the CT angiograms and digital subtraction angiograms into three categories: excellent, high quality for diagnostic purposes; good, slightly lower quality but still useful for diagnostic purposes; and poor, suboptimal for diagnostic purposes. When the image quality of the CT angiograms and the digital subtraction angiograms was judged as excellent or good, the results of the assessments of MR angiography and CT angiography were compared with those of DSA. The reviewers of the MR angiograms and CT angiograms were different from the examiners and reviewers of the digital subtraction angiograms. The C4 segment of the internal carotid artery was excluded from the prospective blinded study, because contrast enhancement of the cavernous sinus can affect measurement of arterial stenoses at CT angiography. After the blinded study, two radiologists retrospectively reviewed the MR angiograms and CT angiograms of 36 sides in 18 patients to evaluate whether the cavernous sinus and calcifications of the vessel walls affected measurement of arterial stenoses at MR angiography and CT angiography. The reviews were conducted by consensus, together with the information of the angiographic findings. The results of DSA were considered to represent the true state of disease for each artery. An artery with stenosis of 50% or more was considered to be substantially diseased; it was otherwise considered normal. Sensitivity, specificity, accuracy, and predictive value in the detection of diseased arteries were calculated for MR angiography alone and for the combined use of MR angiography and CT angiography. Receiver operating characteristic analysis was used to assess the ability to discriminate between diseased and normal arteries for MR angiography alone and for MR angiography in combination with CT angiography (14). Diagnostic accuracy was determined from the area under the receiver operating characteristic curve, Az. Az values were used to analyze the statistical significance of the differences in observer performance by means of the paired Student t test. A P value of less than .05 was considered to indicate a statistically significant difference. To assess interobserver reliability in each imaging technique, the measurements of the first reviewer were compared with those of the second reviewer. κ statistics were used to assess interobserver reliability in the measurements of intracranial arterial stenosis (15). κ values more than 0 were considered to indicate positive agreement; less than 0.4, positive but poor agreement; 0.41–0.75, good agreement; and more than 0.75, excellent agreement (15). A simple flow chart of the enrollment and assessment of patients is shown in Figure 1. Stenoocclusive diseases involving the major intracranial artery were suspected in 35 of these 498 patients, and a total of 18 patients (eight men, 10 women; age range, 43–78 years; mean age, 68 years) were eligible for this study. In all 18 patients, CT angiographic and DSA imaging data were successfully obtained, and the angiograms were of excellent or good quality for diagnostic purposes. Therefore, all the imaging data of 198 arteries of 18 patients were reviewed for the evaluation. A total of 18 angiographic stenoocclusive lesions of 50% or more were available for review: four lesions in the internal carotid artery, nine lesions in the middle cerebral artery, and five lesions in the vertebral artery. The internal carotid lesions included three moderate and one severe stenoses. The lesions of the middle cerebral artery included four occlusions, one severe stenosis, and four moderate stenoses. The vertebral artery lesions included one occlusion, three severe stenoses, and one moderate stenosis. Another 10 mildly stenotic lesions (<50% reduction in diameter), including three in the internal carotid, two in the middle cerebral, one in the anterior cerebral, one in the basilar, and three in the vertebral arteries, were not considered to be clinically important. A hypoplastic A1 segment was observed in one case. The fetal type of posterior communicating artery was identified in three. No hypoplastic vertebral artery was observed in this study. The Table presents a summary of the scoring data for the reviewers. The rows correspond to MR angiographic and CT angiographic scores, and the columns represent DSA scores. Values along the diagonal represent exact matches of the DSA scores and MR angiographic and CT angiographic scores. A total of 35 MR angiographic stenoocclusive lesions of 50% or more were identified. Interpretations of MR angiograms were mainly overestimations of the degree of stenosis, except for complete occlusion. One underestimated lesion was identified. Thirteen (8%) of 170 normal vessels were interpreted as having moderate or severe stenosis. One of five severe stenoses was interpreted as complete occlusion on the basis of MR angiographic findings alone. Grades of stenoses at MR angiography alone agreed with those obtained at DSA in 81% of all segments. MR angiography alone had a sensitivity of 92%, a specificity of 91%, an accuracy of 91%, and a predictive value of 41% for the identification of stenosis of 50% or more. Interobserver reliability between readers for MR angiography alone was good (κ = 0.72). When CT angiography was combined with MR angiography, overestimation decreased substantially, and the rate of complete agreement was 97%. In 35 arterial segments with suspected stenoocclusive diseases revealed with MR angiography, 33 segments (94%) were accurately interpreted with additional use of CT angiography (Figs 2 and 3). Even with combined use of MR angiography and CT angiography, one of 10 mildly stenotic arteries was overestimated as diseased vessels. Additional use of CT angiography yielded a sensitivity of 100%, a specificity of 99%, an accuracy of 99%, and predictive values of 93%. Interobserver reliability between readers for the combined use of MR angiography and CT angiography was excellent (κ = 0.85). Images obtained in a 76-year-old man with mild stenosis of the left middle cerebral artery. A, Anteroposterior angiogram of the left carotid artery shows mild stenoses at the left M1 segment (arrows). B, Selective MIP image (35/9.6; flip angle, 25°) of MR angiogram in the anteroposterior projection depicts hypointensity that simulates severe stenosis (arrow). C, Coronal view MPR image (35/9.6; flip angle, 25°) of MR angiogram also shows stenoses of more than 50% at the M1 segment. Two observers overestimated stenosis in this segment. D, CT angiogram also shows mild stenoses at the M1 segment (arrows). The reviewers correctly interpreted stenosis in this segment. 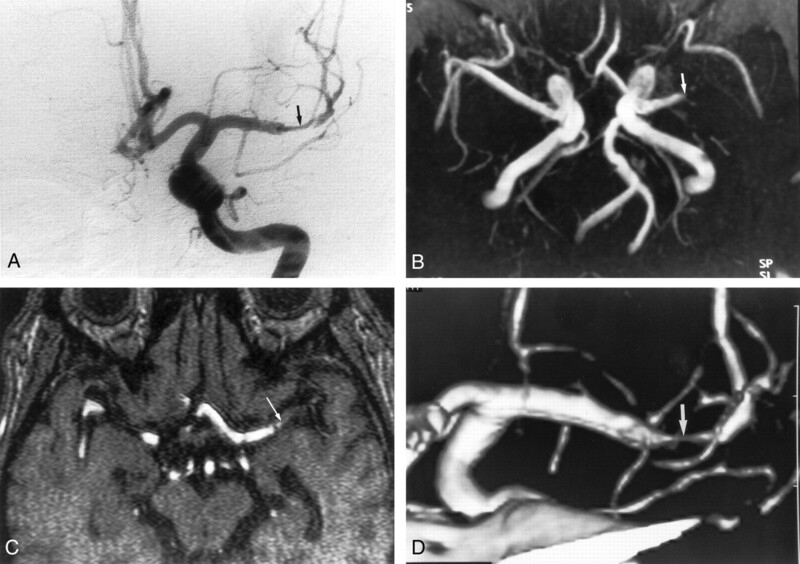 Images obtained in a 47-year-old man with severe stenosis of the left middle cerebral artery. A, Anteroposterior angiogram of the left carotid artery shows severe stenosis at the M1 portion of the left middle cerebral artery (arrow). B, MR angiogram (35/9.6; flip angle, 25°) shows the lesion as an occlusion (arrow). C, On axial source image (35/9.6; flip angle, 25°), the M1 segment was also interpreted as occlusion (arrow). D, CT angiogram reveals severe stenosis at the M1 portion (arrow). Two reviewers correctly interpreted this segment as being severely stenotic. On the basis of Az, the overall diagnostic performances in the detection of stenosis of 50% or more for MR angiography alone and the combined use of MR angiography and CT angiography were 0.86 and 0.98, respectively. The paired Student t test of the Az values revealed that the detection of stenosis was improved significantly by the addition of angiography (P <.05). In the retrospective study, the degree of stenosis was graded correctly by using MR angiography and by using CT angiography in 29 (81%) and 26 (72%) of 36 cavernous portions of the internal carotid arteries, respectively. 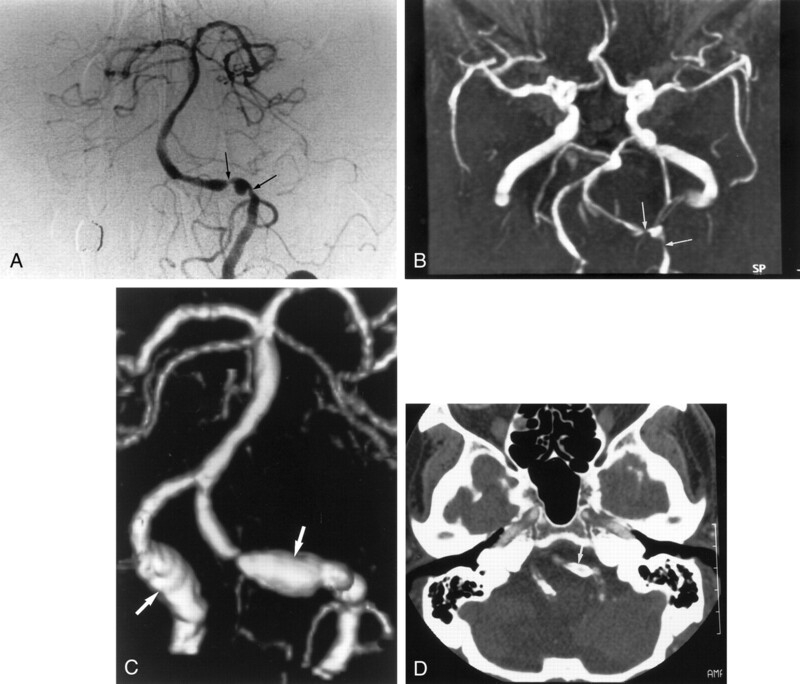 Ten cavernous portions of the internal carotid arteries were not identified on CT angiograms because the cavernous sinuses were equally enhancing relative to the carotid artery. Seven of 36 cavernous portions of the internal carotid artery were overestimated with MR angiography. Five of the seven segments were correctly graded with additional use of CT angiography. However, the remaining two could not be correctly identified because of enhancement of the cavernous sinuses. In 39 of 198 arteries, calcification was identified in the arterial walls on MPR images of CT angiograms. Circumferential calcification was seen in five of the 39 arteries. All five arteries with circumferential calcification were graded as occlusion on the basis of MPR images of CT angiograms, whereas they were classified correctly on the basis of MR angiograms (Fig 4). Images obtained in a 76-year-old man with severe stenosis of the left vertebral artery. A, Anteroposterior angiogram of left vertebral artery shows severe stenoses in the intracranial segment of the left vertebral artery (arrows). B, MR angiogram (35/9.6; flip angle, 25°) also depicts severe stenoses in the left vertebral artery (arrows). C, 3D CT angiogram shows aneurysm-like dilatation of both vertebral arteries (arrows), which correspond to the calcification of the vessel wall. D, Axial source image shows no apparent lumen in the stenotic artery because of circumferential calcification. The segment was interpreted as being occluded (arrow). Finally, this segment was interpreted as being severe stenotic on the basis of MR angiographic findings. Good correlation of MR angiography and conventional angiography in depicting stenoocclusive lesions of the proximal intracranial arteries has been reported (3–7), but MR angiography has a potential for causing consistent overestimation of stenosis. According to these findings (3–7), the diagnostic accuracy of MR angiography for the identification of diseased vessels of the proximal intracranial arteries was a sensitivity of 80–100% and a specificity of 80–99%. In our study, the diagnostic accuracy of MR angiography for depicting diseased vessels was similar to these previous results, although a 1.0-T superconductive unit was used in this study. Several types of artifacts cause limitations in identifying and grading stenosis. First, vessels near the sphenoid sinus are subject to artifactual narrowing or nonvisualization because of the large susceptibility gradient present in this area (3). However, no cases were incorrectly assessed because of this artifact in this study. Skutta et al (12) also reported that this problem was observed in only a few cases, resulting in a superiority of MR angiography over CT angiography in this region. This artifact might have been minimized with the development of MR angiographic sequences. Second, acceleration of flow in the carotid siphon and loss of laminar flow and resultant intravoxel dephasing also can contribute to artifactual signal loss in the C2 and C3 portions of the internal carotid artery, making it difficult to evaluate narrowing of this segment of the vessel (3). Third, MR angiograms of severely stenotic vessels often show an apparent discontinuity in a vessel. The flow void results from intravoxel spin dephasing and the acceleration of spins through the area of stenosis (16). These artifacts were also observed in this study, resulting in overestimation of stenosis based on MR angiography alone. They were not seen on CT angiograms, because CT angiography shows the vessel lumen filled with contrast material, as does conventional angiography. Thus, CT angiography is superior to MR angiography in these matters. Finally, the MIP algorithm has been known to create some artifacts in the images of patients with stenosis (17). In general, the algorithm causes an apparent decrease in vessel diameter and an artificial lengthening of the stenotic portion (18). Combined evaluation of both MIP images and source images is more reliable than study of MIP images alone for assessing the severity of intracranial stenosis (7). Although MPR images, including source images, also were analyzed in this study, the diagnostic performance of MR angiography alone was significantly inferior to that of combined MR angiography and CT angiography. Recent study findings have demonstrated the clinical effectiveness of CT angiography in the evaluation of narrowing of the lumen of the extracranial carotid artery bifurcation, and CT angiography has already been shown to be sensitive and specific in the evaluation of atherosclerotic stenosis of the carotid artery bifurcation (19–22). In contrast, the clinical application of CT angiography in intracranial vasculatures has been more limited than that of extracranial carotid artery studies (8–13). Katz et al (8) assessed the use of CT angiography in the analysis of the arteries of the circle of Willis in 17 patients in comparison with conventional angiography. They concluded that CT angiography was highly sensitive in the detection of arterial anatomies in the circle of Willis. Knauth et al (10) prospectively evaluated the usefulness of CT angiography of the intracranial vasculatures compared with conventional angiography in 21 patients with acute ischemic stroke. In that study, CT angiography correctly showed all trunk occlusions of the basilar artery, the internal carotid artery, and the middle cerebral artery. Recently, Skutta et al (12) retrospectively studied the usefulness of CT angiography for evaluating intracranial stenoocclusive diseases in 112 patients. They concluded that CT angiography was a reliable method for use in grading intracranial stenoocclusive lesions, with the exception of the petrous segment of the carotid artery. The findings of this study proved that combined MR angiography and CT angiography enable highly accurate diagnosis of stenoocclusive disease in the major intracranial arteries. The additional use of CT angiography reduced the tendency to overestimate stenosis at MR angiography and improved the specificity for detecting stenosis of 50% or more. In 35 arterial segments with suspected stenoocclusive diseases revealed by MR angiography, 33 segments (95%) were accurately interpreted with additional use of CT angiography. 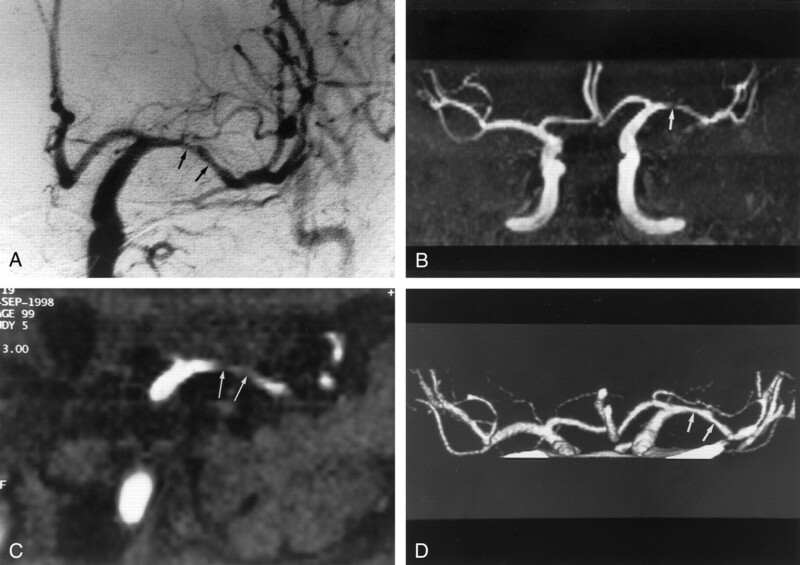 Although one mildly stenotic artery was not graded accurately with the additional use of CT angiography, combined MR angiography and CT angiography did have an accuracy equal to that of DSA in measuring stenosis and depicting occlusion of the major intracranial arteries in most patients with suspected stenoocclusive diseases. We also found that CT angiography had limitations in delineating the lumen of the artery with circumferential wall calcification. Calcifications are the limiting factor on MIP images because of the inability to separate mural calcifications and intramural contrast material. To minimize this limitation, analysis in conjunction with the axial source images may be useful (23). Although axial source images 2and MPR images were used in this study, the arterial lumina with circumferential calcification were interpreted as being occluded. Dense circumferential calcification of the arterial wall may cause artifacts that interfere with the evaluation of the arterial lumen on MPR images of CT angiograms. In the volume-rendering technique for CT angiography in the extracranial carotid artery, calcifications also can be removed by using sophisticated software (24). However, exact delineation of the calcified arterial lumen may be difficult, because the diameter of intracranial vessels is smaller than that of extracranial vessels. Because MR angiography more correctly revealed the calcified stenotic lumens than did CT angiography, we think that MR angiography will be more useful than CT angiography for the evaluation of the lumens of vessels with circumferential calcification. In the retrospective evaluation of the cavernous portion of the internal carotid artery, CT angiography often failed to depict the lumen of the internal carotid artery within the cavernous sinus, because the cavernous sinuses were hyperattenuated. When the attenuation of this arterial segment was greater than that of the cavernous sinuses, the MPR images usually depicted the lumen of the arterial segment. However, when the cavernous sinuses were equally attenuated relative to the carotid artery, this arterial segment could not be differentiated from the venous structure. Although we used an automatic triggering system to optimize the imaging delay time, this problem was not always resolved. In contrast, MR angiography often correctly depicted the segment of the internal carotid artery. MR angiography may be superior to CT angiography in the evaluation of this portion of the internal carotid artery. Thus, MR angiography and CT angiography complemented each other in the assessment of intracranial stenoocclusive diseases. Disadvantages of CT angiography include the need for ionizing radiation, iodinated contrast material, optimizing the imaging delay time, and carefully evaluating the superimposition of bone and venous structures. The amount of radiation during CT angiography certainly is greater than that of conventional CT, but it is substantially less than that of DSA (11). The amount of ionizing radiation may not be an important concern in a population of predominantly older patients. Iodinated contrast agents must be used with caution in patients with serious risk factors, such as renal insufficiency, congestive heart failure, and hypersensitivity to contrast material. Optimization of the imaging delay time is essential to obtain high-quality images for diagnostic purposes. In this study, automatic triggering with the detection of the contrast material bolus was used to optimize imaging delay time. This technique may permit clear evaluation of the arterial lumen by producing a high-contrast interface between the contrast medium and vascular wall. Although we did not evaluate whether this triggering system improved the image quality in this study, this technique seems to provide optimal contrast attenuation of the vessels and may have yielded better visualization of the intracranial artery. Careful evaluation for the superimposition of bone and venous structures is needed when the intracranial arteries are assessed. The basal vein of Rosenthal may overlap with the middle and posterior cerebral arteries. The skull base structures, such as anterior and posterior clinoid processes, contact the internal carotid artery. Usually, this overlapping of the structures was resolved by carefully evaluating the continuity of the vessels with MPR and axial source images. The time required for generating and assessing combined MR angiograms and CT angiograms per person may be generally longer than that of corresponding digital subtraction angiograms. When considering the time for setting and performing the examination, however, DSA usually needs much more time than do MR angiography and CT angiography. Thus, the total examination and assessment time required for combined MR angiography and CT angiography is shorter than that for corresponding DSA. This study had some limitations. First, it would have been preferable to include a much larger percentage of participants with normal angiographic findings. Sensitivity and specificity may vary with a change in the ratio of patients with and those without stenoocclusive disease. Second, our study has some selection bias; therefore, the final sensitivity, specificity, and accuracy may not reflect the true values for an unselected population. We chose to examine only participants with stenosis of more than 50%, as revealed at MR angiography. Evaluation of the cavernous segment of the internal carotid artery was not included in the prospective study, and a diffusely small A1 segment or an intracranial vertebral artery segment was always considered to be hypoplastic and normal. Third, a TE of 9.6 ms for MR angiography is longer than that currently used with a 1.5-T MR imaging unit, and it is well known that images obtained with longer TEs depict more intracranial arteries with artifactual narrowing or flow gaps compared with images obtained with shorter TEs. The TE used in a 1.0-T MR imaging unit generally is longer than that used in a 1.5-T MR imaging unit, because the shorter TE results in a lower signal-to-noise ratio. If the study had been conducted with a 1.5-T MR imaging unit, the results for specificity and accuracy might have been better. Fourth, the intrinsic resolution of MR angiography and CT angiography might have been a limiting factor in measurement accuracy. The actual acquired voxel sizes at MR angiography and CT angiography were 0.69 × 0.39 × 0.7 and 0.39 × 0.39 × 0.5 mm, respectively. Pixel-related artifacts of the vessel margin were more apparent on MR angiograms than on CT angiograms. Higher resolution data acquisition at MR angiography may be necessary to achieve substantial improvements in measurements. Fifth, the region of intracranial vessels covered in this study was limited. Stenoocclusive disease may be missed in more peripheral branches. Acquisition of multiple overlapping slabs at MR angiography and a large scanning volume with multidetector CT may be required to cover the whole cranium. Combined MR angiography and CT angiography provided substantially higher diagnostic accuracy than that of MR angiography alone. Combined MR angiography and CT angiography reduced the tendency to overestimate stenosis with MR angiography and improved the specificity for detecting stenosis of 50% or more. Combined MR angiography and CT angiography had an accuracy equal to that of DSA in measuring stenosis and detecting occlusion of the major intracranial arteries in most patients with suspected stenoocclusive diseases, although CT angiography may not always correctly delineate the lumen of the artery with circumferential calcification and the cavernous portion of the internal carotid artery.